The tucuxi is a mammal included in the Cetacea order, Odontoceti suborder and Delphinidae family. The scientific name is Sotalia fluviatilis. 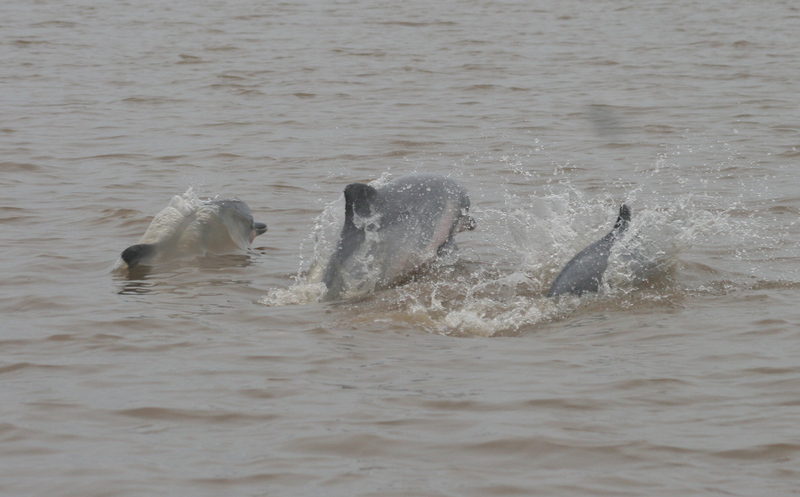 The tucuxi is smaller than the pink river dolphin and is looking similar to the sea dolphins. The face is relatively small and the front head is rounded but not especially prominent with a beak of moderate length. While the eyes are functional, it has poor vision. Colour is blush grey on the back and sides while the ventral region is lighter and sometimes pink. Young calves are grey only. Observation of new calves can be seen both during high and low water levels, basically calves can be encountered year round. 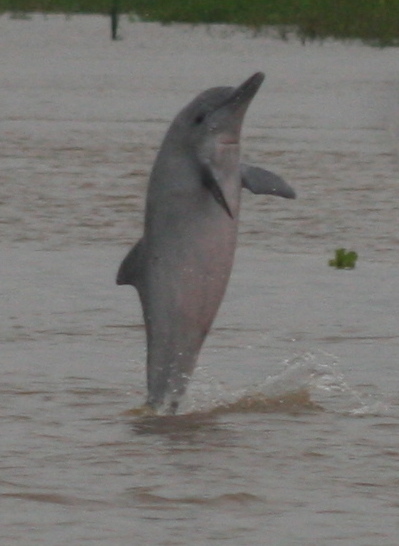 The tucuxi is active essentially during the day and contrary to the pink river dolphin their activity includes vertical and lateral jumps out of water. They live in groups and have an intricate social structure. They like confluences where they can find an abundance of fishes. Distribution of the Tucuxi is in the entire Peruvian Amazon including the National Pacaya-Samiria Reserve. They have been observed in white waters (Marañón), black waters (Samiria), clear waters, confluences and lakes. Most of the observations were done in the principal tributaries of the Amazon and the Marañón rivers. Even in the upstream Marañón and Ucayali in a range 0-300m above the sea level, but not in the upper waters where pink river dolphins exist. The tucuxi seem abundant and the population has been relatively stable in the Pacaya-Samiria Reserve during the last 10 years where groups of 20 specimens have been observed. IUCN Red List Category: (2010) DATA DEFICIENT (DD) due to the lack of good data. The species is in Appendix I of CITES.